Ahead of the upcoming FIFA Street UK release date, developer EA Sports has released a new FIFA Street trailer outlining a number of the game's upcoming venues. A little more than a month ahead of the game's March 16th arrival EA has offered up a developer's trailer detailing the variety of pitch types, venue locations and walled enclosure offerings set to be made available to fans of the urban football sim. Playing host to 35 different venues which encompass a variety of infamous global locations, the different FIFA Street gameplay modes will see varying settings used such as a parking lot for a game of two-on-two. Confirmed at GamesCon last year, FIFA Street will allow gamers to tackle a variety of pitch types from the childhood memory inducing concrete playground to extravagant show piece stages set in global landmarks such as London's Piccadilly Circus, Tokyo and Amsterdam. "Street football is all about flare, so we'll have the likes of heel passes and flare passing. What we're debating over right now is how difficult to make a pass,” said EA's Creative Director of FIFA Street. 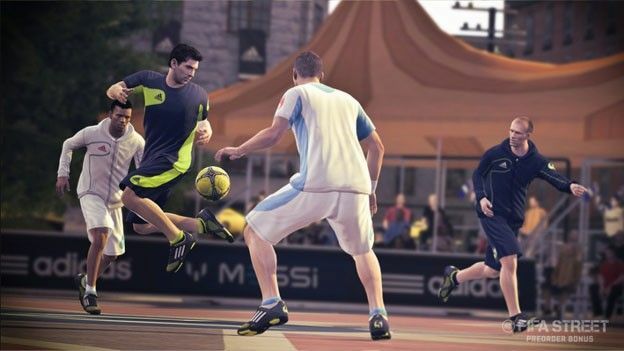 Which EA football title is the one for you, FIFA 12 or FIFA Street? Or are you more of a PES fan? Let us know via the comments box below.